Two bands with (almost) the same name that still managed to exist side by side: you don't see that often. 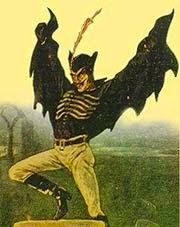 The Americans (Spring Heeled Jack, also known as Spring Heeled Jack U.S.A. and specializing in ska, 1991-2000, USA) were probably the first users of the name, the English (Spring Heel Jack, using a slightly different spelling, with electronic music on the repertoire) followed in their footsteps soon afterwards. The name probably has the same background in both cases: it refers to a mythical figure in English folklore. Spring Heel(ed) Jack was active in Queen Victoria's England. Hyperactive one might say, because it concerns someone who was capable of making huge jumps. Jack was spotted for the first time in 1837; his field of hyperactivity covered almost the whole of England, from London up to Sheffield and Liverpool. Later he was also seen in the Midlands and in Scotland.